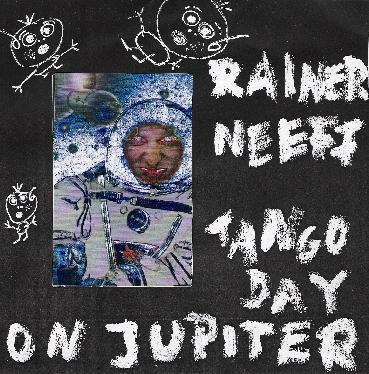 Rainer Neeff - "Tango Day On Jupiter"
Rainer Neeff is the guitarist in The Pancakes, a German psychedelic band that some AI readers may be familiar with. When he's not playing with The Pancakes, he likes to create CD's full of warped, lo-fi, deliciously wigged out psychedelic tunes. Tango Day on Jupiter certainly has a wide range of demented sounds, from the bouncy, 13th Floor Elevators' like garage rock of Aladin Im Weltraum to the surf rock on acid pulse of Agentenfilm to the nice, darkly tripped out mood of Eclypsed on Purple Hills to the early 60's Euro-lounge groove of Spreat Your Angel Wings (the titles aren't spelling errors on my part, by the way, that's how they appear on the album...all just adding to the strangeness of things!). Rainer puts together some truly oddball hybrids, like the tremelo drenched spy music meets experimental psychedelic cartoon humor of Elefanten Tango and the throbbing, avant garde sound collage meets smokey guitar blues of Zeitzonenwechsel. There's even what might be an homage to Pink Floyd with the spacey blues of Dark Side of the Moon. In amidst it all are numerous little sound experiments with titles like Gnom, Space Robot Gnom, and Tango Gnom, which serve to add even more whacked out flavor and freakiness to the proceedings. It's all great fun, and not to be missed for fans of lo-fi, eccentric psychedelia. Bring along your bong and your sense of humour and enjoy the trip! For more information, contact Werner Neeff at neeffmag@yahoo.de. or write: Werner Neeff, Gartenstr. 32, 72458 Albstadt, Germany.